Manga Reviews ~ Ramblings of A Fob. | "Not your ordinary well thought out constructive Review. Raw Ranting at its finest." Jigoku Shojo or Hell Girl is an episodic manga that revolves around revenge. These people who have done a terrible thing to others can be send to hell by entering their names through an internet site. In exchange for this creepy service the senders own soul will also go to pits of hell once they die. Pretty damn terrible right? That premise alone is ridiculous. I meant if the circumstances of the stories presented in the first volume had been written with a solid plot and had much more of a character development it could be intruiging but instead we get in each chapter different set of case that has flimsy plot of blackmailing peer, a baker who steals ideas of his student, a vet who cares about his own than the animal he needs to look after and other easy to resolve case without resorting to sending anyone to hell. All of the tale contain in here were so easy to confront and deal with but instead the characters would eventually get their vengeance by summoning the Hell Girl. Not only that, once the hell girl appears to take the wrong doers she would keep telling the same line over and over again. The plot gets so repetitive and boring. It’s a pity. Not only does all the character has no development but it also shows they’re weak to fight back. They are ok to go to hell as long as they get their sweet revenge. Leads me to wonder if they truly thought about the outcome of their action in the afterlife.. The art and character designs is destructing as well. The dragonfly eyes and the somewhat disproportion body of the characters are prevelant in the series. Unfortunately nothing redeeming about the series. Do yourself a favor not to let the Hell Girl come out. Ok. I stopped reading manga since last year so here is the first volume I have managed to read. 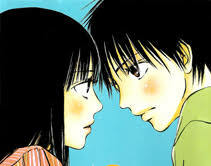 It took me awhile to get into the story of Strobe Edge. I seriously thought that its appeal have disappeared. But I’m glad that after a few flipped of pages I find it as captivating as I felt back in the first volume! A new character has been introduced in this second volume, Ando Takumi. He is one or maybe the guy who has the “popular” title around. He’s a player and he downright loves women. He would even ask every female student whom he come across for their cellphone number. He’s somewhat happy go lucky, carefree kind of guy. After Ninako’s confession by the end of the first volume, she is wondering how her relationship with Ren will be. Even though Ren rejected her she still like to be his friend. But this predicament of hers led into meeting Ando. She accidentally thought of him as Ren while he’s walking the school corridor. So yeah Ando used that to annoy and get close to Ninako. But instead, slowly but inevitably Ando is taking an interest on Ninako because of her peronality. All the while Ren has noticed what is happening between them and told Ando to back off Ninako. Ando tells him otherwise as mentioning Ninako is not his girl and the fact that Ren has a girlfriend so its nowhere his right to tell him off. I like what direction Strobe Edge is going to. I’m a sucker for love triangle and I’m all for it. One thing I find so disappointing is that Daiki (which I rooted for in the first volume, the childhood friend who has a crush on Ninako) was shoved aside. But anyway, enough of that nitpick as Sakisaka provided a new male character that is interesting enough to fill in on Daiki’s shoes. I still don’t like Ren and I don’t think I ever will. He has great quality for a male lead but still, I am never sold. Ando and Ninako’s cat and dog relationship is somewhat cute. Ando is really understanding and sensible of what is happening. So yeah I’m in his bandwagon. I still wish Ninako have been design differently she look so naive and childish but thats just me venting. All in all volume 2 of Strobe Edge is still Recommended for your dose of shojo fluff. Skip Beat. Seriously I already checked this series before and I remember that I didn’t liked it. But again I gave it one more chance hoping that I find it much interesting this time around.. Unfortunately I felt the same as I did the first time. I more so end up feeling less invested after I finished its first volume. Kyoko is a hard working girl that is living with his childhood friend Ren who is a promising rising star! She is head over heel in love with him that she’ll do everything for him. She even pay all the bills to their expensive flat! But one day she learns the truth about her purpose for Ren. She is just a tool he uses to ensure his survivality ever since he decided to pursue his celebrity dream in Tokyo. She decides to get her sweet revenge by beating him to his game. Kyoko plans to enter the crazy world of showbiz! Skip Beat is rather a popular manga series as I have read such glowing reviews about it hardly negative ones. Unfortunately I am on the minority here. I didn’t find anything that is interesting nor did I find it generally terrible. Judging by the first volume its an average series. It lacks everything I look for a manga; characters that I would want to read about. I don’t hate Kyoko but I don’t like her either. She seems shallow minded but then she displays perseverance and strong will. I hate the fact that of all the years, she hasn’t taken any sort of hint that she is merely being used. I won’t even talk about Ren. He’s a pampered brat, he thinks only of himself he doesn’t have any redeeming factor but then again its only by the first volume. He is set to be like that for revenge purposes.. I find the comical side of this series lackluster. I don’t find any of it amusing. I was wishing that it takes itself much seriously in some part of the volume. I find the goofs of the series a huge hindrance. I also have problem with some of the pages, it gets really busy as the author tend to overly exaggerate Kyoko’s reactions. I find it distracting, there is a whole lot of excessive mess thrown in some pages. The art is weird, most of the characters have long limbs and have this alienesque face shapes. I love model features but in manga it looks weird. lol. It could have been better if the series tone down its comical side, but then again I think I am the only beneficiary if that happened. It felt draggish, I almost couldn’t finish the first volume. I had to force myself to finish it hoping that I’d like it. But it never did. Don’t get me wrong revenge plot is one of my guilty pleasures. I once got addicted to ABC’s drama series “Revenge”.. I still have a slight hope left for this series. I still wish I’ll warm up to this in the next volume. I freaking have 12 volumes, but then again I am not that fond of the first volume. I don’t get the love but maybe it does get better. Ugghh I have problem getting into mainstream series as I often find them overrated TBH. Skip Beat – I almost Skip its Beat.